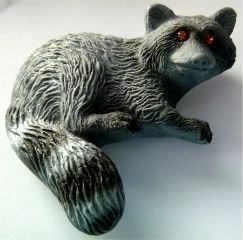 I bought this magnet a couple of weeks ago, his eyes are all bedazzly which actually makes him creepy as hell. All in all, I hate this little guy. Sure, he's cute when he comes to visit the back door. But really, he's just doing recon for the next time we're dumb enough to put our garbage within reach of his tiny little paws, and he can take it and scatter our refuse all over the backyard. You won't get me, enemy mine!